"I think Lucky in Love is one of the best books on the subject of love and relationships I've ever read. I run the matchmaking program at a large singles organization and immediately ordered copies for every member of my program." 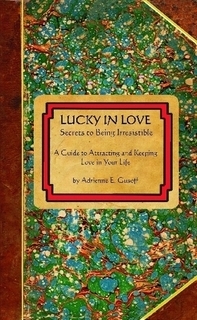 "Lucky in Love is insightful, funny and full of great advice. I've reread it dozens of times already, and every time I do, I understand Adrienne's philosophy a little more. It's especially helpful when I'm in the midst of relationship problems. This really helps me put things in perspective." "From the first page, Lucky in Love had my attention. It explores all those things you already know, intellectually, about love and explains them in a way your emotions can understand." "I've been carrying around Lucky in Love in my handbag since I got it three weeks ago. I reread it every day, and every time I do, I absorb a little more of Adrienne's very wise philosophy." "This book makes so much sense. It should be required reading! " "Adrienne's lectures are so inspiring, and this book is a continuation of her positive and amazingly useful philosophy. Often her suggestions require a serious change of attitude on my part, but every time I follow her advice and make that effort, I see the benefit in all my relationships."